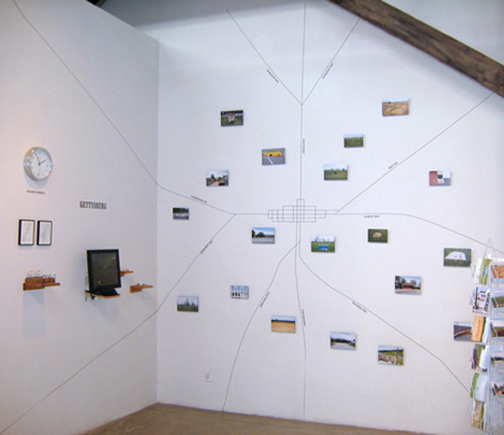 My multimedia installation Gettysburg was shown in the group exhibition “Ruburbs and Other Spaces in Between” at The Athens Institute for Contemporary Art (ATHICA) in Athens, GA. 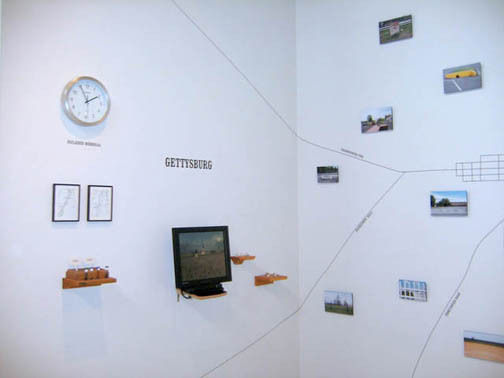 The installation functioned as a kiosk for contemporary Gettysburg, while subverting the grand historical narrative and heroic landscape visions commonly associated with the site, offering new interpretive possibilities. Elements included a wall map with images of alternative monument designations, mock tourist video, Civil War artifacts and a postcard rack containing my Historical Amnesia line of cards. For more about this project, please refer to my artist statement. In the installation “Gettysburg,” Bryan Hiott, an artist from New York City, has created a portable tourist kiosk of the town, but rather than featuring historic landmarks, the images in his photographs, video and “Historical Amnesia” line of original postcards are of street curbs, a FedEx drop-off box, balding patches of grass and pale expanses of dirt and concrete.His work shows the collision of past and present: in one of his videos, re-enactors fire their muskets in Civil War dress as traffic whizzes by the large hotel in the background.